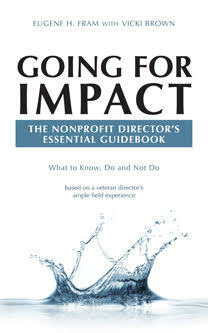 A nonprofit board member comes up with an idea that he thinks will do wonders for the organization. He is convinced that establishing a for-profit subsidiary will not only be compatible with the group’s mission but may even bring in new sources of revenue. It’s his ball–now what’s the best route to run with it? All too often in the nonprofit environment, initiating change can be as daunting as trying to get consensus in the US Congress! There are, however, certain interpersonal levers, which, if pushed, can accelerate the process–although one hopes that not all the levers will be needed in any specific situation. Board Colleagues – Quietly enlist as many board colleagues as possible to support the idea. Enlisting support from board opinion leaders is critical — then open up the discussion to others in informal conversations. Premature presentation to the entire board could stall the process. The CEO – Either before or during conversations with board colleagues, be certain to review the proposed change with the CEO. He/S will voice acceptance, rejection, or asks to consider it. If s/he is opposed to the change, the board member only has these alternatives – wait until a new CEO is engaged; seek board termination of the CEO that is generally not a good move; or wait for better timing and board support. It is foolhardy to seek the change in face of the full opposition of the CEO. If the CEO will support the change, it may be a good idea for the board member to step back and make the CEO the leading change agent. Revenues – No matter how good the change, implementation will likely require financing beyond current budget allocations. Consequently, a plan for fund development from foundations and individuals will be needed for the final proposal. Other Organizations—Other organizations with similar situations could serve as useful models. An on-site visit will provide information and enable the nonprofit to develop benchmarks that will reassure those that remain skeptical. Board directors have relatively short tenures—usually six years or less– and are often regarded as temporary overseers. There are opportunities to be much more than that if the board operates in a 21st century generative manner. The board climate should be open to ideas of positive change, and the creative board member must appropriately adapt or adopt the above levers to ensure effective acceptance and implementation. ← Can the Deloitte® Governance Framework Be Applied to Nonprofits? Great points on initiating positive change. I would like to add seeking the advice of your professional team, such as the CPA/auditors and legal team at the concept level. Too many times we’ve run into situations with clients who have undergone the process of implementing change only to find out the unintended consequences on their exempt or legal status. Great insight. I can easily see one overly aggressive director taking the board into violating Intermediate Sanctions.